Picturesque rural scene of cottages near Southend in Essex. 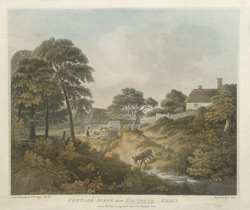 This is one of a group of four cottage views in Essex by William Redmore Bigg A.R.A. Southend on Sea was a small village in south west Essex, on the estuary of the Thames. Daniel Defoe travelled through the area in the late 18th century and noted the marshy and low lying land.